GRID Alternatives, Solar Energy Industries Association, Sunrun, United Methodist Women, Vote Solar joined the NAACP to kick off a solar equity campaign focused on low-income communities and creating jobs . . . Called the “Keeping it Green While Living the Dream”, the coalition has made a year-long commitment to train 100 people, install solar on 20 households and 10 community centers and strengthen laws in at least five states that strengthen equity in solar-access policies. Read more here. The toolkit contains modules to help guide individuals and communities move towards an energy economy that is sustainable, equitable, and just for all its members. It includes a section on how to pass net metering, distributed generation and community shared renewable energy policies, a fact sheet on advancing equity, inclusion, and leadership in the solar industry, and a fact sheet on solar consumer protection. 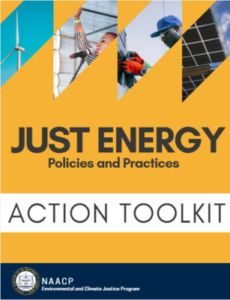 The toolkit is designed to operate in conjunction with the NAACP’s Just Energy Policies: Model Energy Policies Guide, which contains specific information for people wanting to change policy. This entry was posted in NewsBlog and tagged "Keeping it Green While Living the Dream", climate action, Grid Alternatives, Just Energy Policies and Practices Action Toolkit., NAACP, Solar Energy Industries Association, states' solar-access policies, Sunrun, sustainable economies, United Methodist Women, Vote Solar on January 16, 2018 by Helen Deffenbacher.